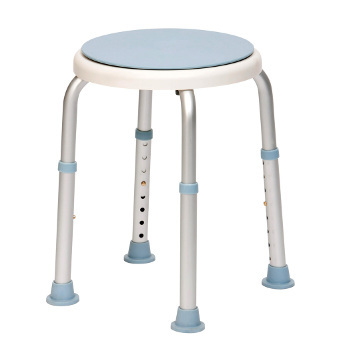 This Shower Stool with a Rotating Seat from Drive Medical, is the perfect shower and bathing aid if you are someone who seeks or needs extra levels of safety, security, comfort and versatility. Because slips and falls account for the vast majority of injuries sustained on wet floors and on equally slippery bath or shower surfaces, this seat comes with a comfortable rotating seat that turns in unison with your body; whenever you find it necessary to reach for something or turn yourself while in the bath or shower. This free flow movement can greatly reduce the twisting motions and other forms of stress that are commonly placed on your back, arm and shoulder muscles whenever your legs are forced to remain stationary while the upper portions of your body are forced to turn and twist when reaching for an item. The shower stool's seat can be removed for easy cleaning and can be adjusted up or down from 34 to 52 cm. How Can Shower Chairs Help? Shower chairs are designed to help individuals who are suffering from weakness of the limbs or limited mobility to take showers without the risk of falling or further exacerbating their respective medical conditions. The shower chairs that we sell are durable and are typically made from aluminium or plastic. These materials are ideal because they do not deteriorate or rust when exposed to moisture. Individuals can choose from a variety of shower chairs based on their weight and height, as well as the dimensions of their showers. After Surgery/ Post Op - After an individual has undergone a serious operation, they will usually be required to undergo special care and post op treatment for a period of time before they can return to their routines. Shower chairs are extremely useful in these cases as they afford comfort and convenience, allowing individuals to avoid exertion when showering. Arthritis – In many cases, arthritis is a chronic condition, and an individual who suffers from arthritis may never return to a state of full mobility. In these cases, shower chairs can be used to help individuals bathe comfortably, without causing discomfort or further damage. Knee/Hip Replacement - Knee and hip replacement surgeries are becoming increasingly more common among senior citizens. After these operations, patients will be required to rest these joints for prolonged periods. Such individuals will find that shower chairs offer increased convenience and ease while helping prevent falls in the shower. Multiple Sclerosis - Multiple sclerosis is a condition that affects the muscular, nervous, and even respiratory systems. Individuals suffering from this condition typically experience weakness and limited mobility. For such individuals, shower chairs are an important fixture in the bathroom.